Bulldogs – a breed developed from Mastiffs and which acquired their name about 1630 – were also used to bait bears and badgers. The tremendous upswept jaw, with a broad nose set back almost between the eyes, was developed so that the Bulldog could breathe while it was hanging on to the neck of its unfortunate opponent. Horrifying accounts relate the animal’s courage and tenacity in the bullring. Originally bred for the sport of bull baiting, which was popular in England for more than 700 years before it was made illegal in 1850. Today’s Bulldog is a far cry from its ancestors. It is more heavily built and less athletic than those dogs that were used to torment the bulls. Bulldogs will normally live for about eight years, but given the right environment and sound nutrition will usually live up to ten years of age. A healthy female should weigh about 20kg and be 30cm tall while the male should weigh 25kg and be 38cm tall. The British Bulldog is usually placid and gentle, but can be jealously territorial around that which it regards as ‘its own’. Its appearance, rather than its temperament, is its only asset if looking for a ‘watchdog’. But it certainly has courage when called upon to defend its property. Its burly figure and massive head and jaw would undoubtedly deter any marauder. The Bulldog enjoys the company of its owner and displays a loving nature at every available opportunity. It is stoic to a fault. As with all animals, training and kind discipline should begin at eight weeks. If a puppy is not discouraged when it jumps up on its owner, it will not be its fault if it is a nuisance later on. It is primarily as a family pet that the Bulldog scores well and it will repay you with many years of devotion and good health in return for your care and companionship. Most will be amenable with other dogs, but there are individuals within the breed that do not care to share their home comforts with other species. It would be advisable to introduce any Bulldog to cats at an early age. It is recommended would-be purchasers learn a little about the breed before purchasing. 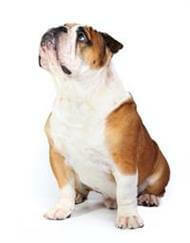 A smooth-coated breed, the British Bulldog is generally a clean animal. Folds in its face need to be cleaned daily by drying them out with cotton wool, applying a petroleum jelly, and then wiping it out to create a barrier against tear stains and to prevent chafing. The area underneath the root of the tail requires the same attention. And a little smeared over (and left on) the nose daily prevents it becoming crusty. Toe-nails (especially the dewclaws) should be inspected weekly to ensure they have not become too long and require clipping. Daily brushing for five minutes, and a wipe over with a damp flannel should keep your dog looking and feeling in top condition. Cooked bones should never be given nor any small bones that could become caught in the throat. Fresh clean water should be available at all times. A daily walk around the block should suffice for exercise, preferably early in the morning or late in the evening. These dogs do not enjoy getting overheated and great care should be taken to ensure that they are in a comfortable temperature at all times. Agitation, particularly during hot weather, can prove fatal. The build of this breed determines that it is not a dog to be vigorously exercised, but nevertheless should always be maintained in top muscular tone. Recommended for all those both sensible and sensitive to the needs of this breed. Very young children would need to be taught to respect the animal and its requirements. It is not suitable for exercising by anyone of a frail build, as the breed can be quite rambunctious.